Everyone should be aware that Running the Bulls is by no means a frivolous event. To run against the horns of a fighting bull, to expose yourself so directly in front of an animal that could so easily kill you, needs at least some preparation, both physical and mental. A large part of that preparation involves the mental aspect. The control of one’s emotions is vital when one’s very life is in danger. Some runners think through their run and try to anticipate, to the extent that this is possible, how the Running will unfold and to anticipate some possible escapes, should this become necessary when the bull is drawing close. Others simply try to overcome any sense of fear and look to family, friends and above all, other runners for comfort when fear creeps in before they run. Ignacio Rubio was witness to such a scene in the streets of Pamplona just some short 10 minutes before the Running of the Bulls when he found himself on one of the balconies of the Kukuxumusu offices. 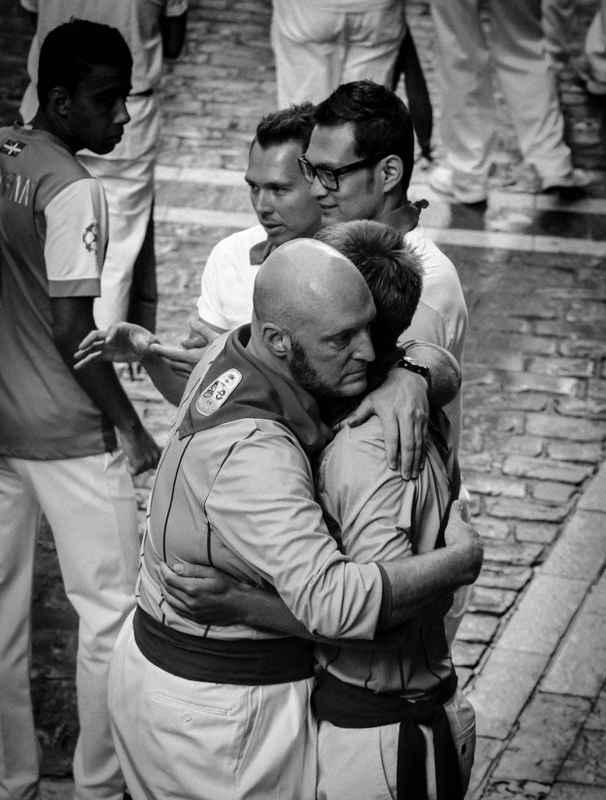 With his camera in hand and using his intuition he discovered a moment of this sense of fraternity and captured it in time. ” this warm embrace between two runners and the serious gesture on the face of the runner when he embraces the other as they share some mutual encouragement is a significant sign of just how dangerous it is to run in this event”, he explains. 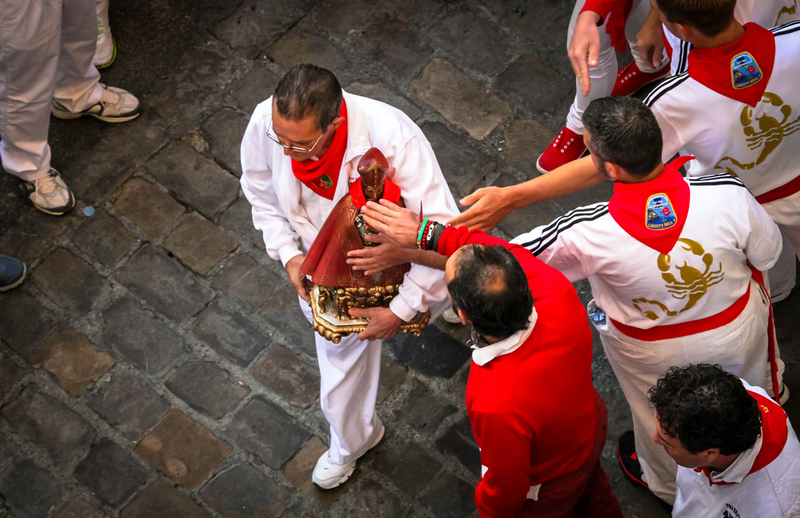 Another frequent sight in the Pamplona Bull Runnings is the different ways that some of the runners make a supplication for protection from the Saint Fermin himself. For many runners this is no empty gesture and they have a deep and blind belief in the ability of the saint to protect them. Good-luck charms and medals, rings, scapulars, even tattoos of the saint may be easily seen among the crowds of runners. So that even a gentle stroke of the figure of the saint to whom they will sing the short homily” a San Fermín pedimos” just before the run begins, is no empty gesture. “That moment when a young runner bore the figure of the saint through the crowd, heading towards the niche in order to place the saint there and to see how some of the other runners reached out to touch it, to beg his protection and luck has remained in my memory ever since.” relates Rubio who captures all this emotion of what the Running of the Bulls is all about in this snapshot.